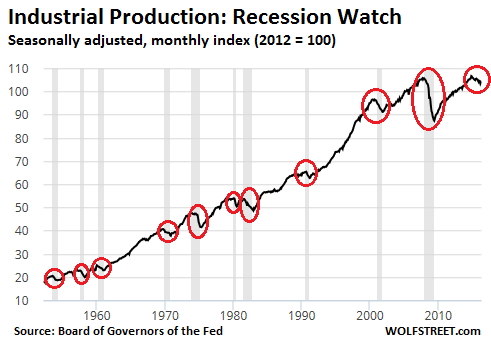 Recession Watch: huge brake shoe to drop on the economy. Just how much has that “growth in economic activity” picked up? Yesterday, it was total business sales, which have been dropping since July 2014 and are now back where they’d been in April 2013. Today it’s industrial production. The Fed’s Board of Governors reported that industrial production contracted 0.4% in May, after having expanded 0.6% in April. This is like Chinese water torture: drip by drip, with periods of calm in between that are just long enough to think that it’s over. Year-over-year, industrial production was down 1.4%. Manufacturing, which accounts for about 80% of industrial production, output fell 0.4%, “led by a large step-down in the production of motor vehicles and parts,” which plunged 4.2%. The auto sector has been booming. Last year, it set an all-time record in unit sales. Manufacturers are inebriated with their own optimism. Auto lending is soaring, and auto loan balances are blowing through the headliner. If the auto sector is slowing, that would be a huge brake shoe to drop on the economy. Alas, it may already be in the works, and it goes far beyond subprime [read… What Will Sink the US Auto Boom?]. Even without autos and auto parts, factory output fell 0.1%. And capacity utilization, a closely watched gauge, fell 0.4 percentage points to 74.9%, down 4.0 percentage points from its recent peak in November 2014. It’s back where it had been at the end of 2010 as industrial production emerged from the collapse during the Financial Crisis. As always, the strong dollar got blamed, along with weak global growth, and low commodity prices. Official recessions are declared by the National Bureau of Economic Research (NBER), normally after the recession is already over. The Great Recession was the exception; it was so steep and so long that NBER declared its beginning while the recession was still going on. So if in the 2000 recession, you looked at industrial production, it showed a similar pattern as today, but the NBER still hadn’t pronounced the magic words though it would do so later. There were times when industrial production fell before the official recession began; other times, it fell only after the recession had already begun. The year-over-year percentage change of Industrial Production shows a similar pattern. The current percentage decline is worse than the percentage declines at the beginning of 16 of the last 17 recessions (the exception was the 8-month recession that began in February 1945). OK, I get it. The US is largely a service economy. Healthcare is closing in on 20% of GDP, and it’s booming. That’s always a boost to GDP, even if it’s among the worst kinds of boosts to an economy. There are some other sectors that are still growing. 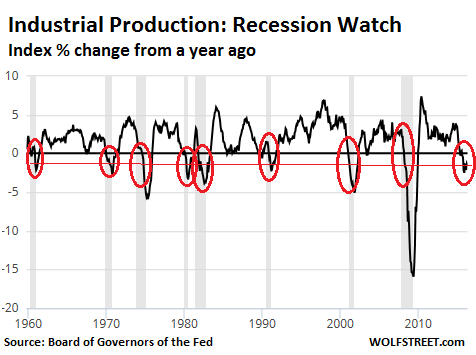 But industrial production is one of the many data points that keep us on our recession watch. And if the auto sector begins to lose its grip, it’s time for NBER to get busy. Yellen & Co. have a problem, though: this is the economy that has been saved and healed, as we’re constantly told, by trillions of dollars in QE, by the “wealth effect,” by seven years of zero-interest-rate policy, and by the most massive bailouts of banks and Corporate America during the Financial Crisis when the Fed lent them many trillions of dollars to keep the whole system afloat. Savers have been sacrificed on this altar. The economy however, never really regained speed – and now it’s losing what little speed it had, and it’s losing altitude. It’s flying below stall speed despite, or perhaps because of, the Fed’s harebrained monetary treatment and all the distortions and perversions they caused. And when the next recession hits, and the Fed decides to try to save and heal the economy once again, it will experiment with even more harebrained measures to obtain even greater success, or whatever. That’s what worries us. Lets hope that when the next recession hits, Yellen will be writing her book “The courage to do nothing” this time. Interest rates are the cost of capital. When capital is scare, rates are high and people have an incentive to save. When capital is abundant, interest rates are low and people have an incentive to spend. That’s it, no need of artificial distortions of the invisible hand. There is no need for freaking FED with a bunch of old fart vain pedants sitting in a conclave thinking they are gods. By the end of Ronald Reagan’s term, 138 administration officials had been convicted, had been indicted, or had been the subject of official investigation for official misconduct and/or criminal violations. Multiple hundreds of prison sentences were handed down in the wake of the S&L financial crimes, with companies forced to liquidate and shut down. If justice were not hamstrung and compromised by the present administration, the Reagan record would be seen as small potatoes in comparison. The Clinton’s would be facing a judge and jury, along with a multitude of others from not only the beltway, but from the upper reaches of Wall street. Next recession …. that will be the collapse. Because the tools are used up and worn down to hunks of worn out steel… the ratchets have lost their edges and will not grip the bolt…. the screw slots are stripped…. the saw is dull…..
To clarify — the central banks have done ‘whatever it takes’ to keep us from recession — but as expected they have failed. QE ZIRP NIRP Buybacks you name they have done it – they are in the process of ripping out the kitchen sink…. So when they fail — of course they must fail – there is no perpetual economic motion machine — money printing is not a viable business model — they will have nothing left. The deflationary death spiral will begin — with no way to stop it. The killer is the fact that western, so called developed economies, are tanking inexorably towards failure. Many reasons. All “dynasties” fail after 250 -300 years and ours started about 1750 or thereabouts. Demographics, as per Harry Dents observations, are drastically reducing total spending power. He thinks we will get through it by 2023, but I doubt it. Millennials so now indebted will never be able to substitute for the Boomers good times. One more reason; Banks, and corporations, are parking money in share buybacks and t-bonds because they see little opportunity for investment. and the fed gives good enough returns with less risk. Neo-liberal policies of cutting government spending are proof cutting is no path to prosperity. There are opportunities out there but our political minnows wont go for them. Then there is the energy equation, ERoEI etc. Oil is 11/1 now heading down and below 5/1 [if I recall] it’s game over. That time is close. Not much to look forward to! You are correct when you cite a demographic issue. Nobody wants to talk about this. We are an aging society and that is directly reflected in the growth of health care expenditures. Look at Japan and Europe and see what the US will look like in a another decade. Easy money won’t fix this. As unpopular as this may seem to some, we need more, not less, immigration to jump start our economy. Simple math – without more workers to support the elderly the system does not work. Of course, there are a host of other issues, not the least of which is the mountain of debt that the current working segment of society is laboring under. If and until this issue is addressed there is little prospect of any sort of economic recovery. A country has to ask itself: if the country has economic growth but the population grows faster (due to immigration), per capita economic growth may actually be negative. Per capita growth is what individuals feel. Japan is at the top of the list when it comes to per capita growth and blows every country away when it comes to economic growth per working-age person. That’s what individual Japanese feel. And they actually are doing pretty well, on an individual basis. A growing population just cuts the economic pie into smaller pieces. And it supplies cheap labor for companies – not what individuals wants. Higher production costs for oil have a similar impact — they actually reduce the size of the pie — meaning smaller slices for everyone. Which means we get less nett energy — less free slaves to run the economy. Think about this — if your car were to run out of gas 30km from the next station. Imagine the amount of effort that it would take for you to push your car to the station! You’d never be able to do it — if there were no hills perhaps 10 strong men could do it…..
And it would take hours…. That – is what one unit of gasoline will do for you. Before the age of fossil fuels slavery was ubiquitous — economies were built on the nett energy output of a slave – the difference between the food you had to feed them — and the work you could get out of them. Slavery did not lose favour because we suddenly became kinder…. it mostly disappeared because we found something that provided a better return (and it didn’t run away). The tractor was far more efficient than the slave…. And they will continue to get smaller because the pie cannot grow — we have run low on cheap to produce oil. And every single second — we are burning up the last of oil on the lower branches of the oil tree…. Which drives up the cost (tar sands/fracking/deep sea/low quality reserves like in Venezuela) which means less nett energy is available…. Complaining about the Democrats or Republicans will not change this. Well – maybe you can get a bigger slice of the smaller pie if you fight like a mad dog for it….. But the trend is baked into the pie… It is getting smaller — it is difficult to get a bigger piece…. most people are going to find their pieces getting smaller and smaller and smaller…. You can scream at the physics of the situation — but physics is a cold and hard character — he will not respond…. he follows certain immutable laws…. Today is better than tomorrow – tomorrow will be better than the next day — and so on. We are fast approaching that moment. It depends on where the immigration comes from. Demographics are destiny, and remember, you can not substitute one culture for another and retain the same culture you started with. Also, social capital is only based on immigration of like peoples. Otherwise, you have social disaster, riots, anger, etc. Within the next 5 years, at most, we will all witness the mistake occurring in Europe, that was predicted about 50 years ago by the book “Camp of the Saints”, a French writer, and in the speech by Enoch Powell, “River of Blood”, a British member of Parliament. Even the 1960’s actress, Bridgett Bardot warned us and she was trashed and almost sent to French Prison. There have been many Prophets warning the West, but they were dismissed, or called insulting names. But, they were right. It is going to get worse before it gets better. Just remember, social enjoyment and a peaceful nation is worth more than economic growth. It is better to have one car, and not have to worry about locking it (1950’s), than 2 cars, each locked with the auto alarm turned on, in a locked garage, in your locked gated community (today). Hey, remember when there were no such things as a “car alarm”? Why is that? Banksters need to make more debts to increase their take from the system.. More people are required to pay ever increasing debts. No way out of exponential growth in debt other than increase production and increase consumption. Add in lots of warfare and this system only works with the growth in population. That gives you a complete circle. More debt = need for more people all to benefit the Banksters. At some point this whole mess is going to collapse and it’s going to be worldwide.. The great unwashed, who are real drivers of all economic activity, have been left with nothing except for the bare basics. We don’t need a Govt. with the courage to do nothing, unless we want a genuine revolution that will be decided in the streets, but to do what was done in 1933. All of the alphabet agencies and regulations gave us stability for almost 50 years.. Nothing like that was accomplished or even considered after 2008 except to bail out the culprits and now the bills are coming due. Couldn’t agree more. The average family is getting ground down and ground down some more. But when only the basics can be paid for it all grinds to a halt. I still see restaurants doing a fair amount of business. When you can get an inexpensive meal large enough to have left overs for another meal it can be cheaper than buying at the market. Strange world we live in. There has also been a shift in values. Doing things vs. owning things. Going places vs. buying more stuff. Inherent in that is a shift in wealth to the providers of ‘experiences’ vs dolldrum shopping. A shift is not the end of the world. Only for the Mall owners and associated retail chains. Sorry but this is old news. The sky is not falling, consumer tastes have changed. Period. In the age of the population argument, the US is doing better than others. We have healthy immigration. WE are not taxing as we should to cover basic infrastructure costs because we have a fear filled do nothing Tea Hack Congress that simply refuses to fund needed expenditure. Republicans are failing at basic governance as they obsess on social issues vs the welfare of those governed. Face the music Republicans – You own the purse and refuse to simply spend required funds not excess funds. Yet they retain office, power and benefits of the kinds most dream of. Yes its about to time call out those in power for the mess they are perpetuating. Business is hardly any better on raising wages etc. They would rather buy back shares than generate honest demand and offer services and products people want or need. The thinking and creativity involved in book keeping moves is whats needed in the business they profess to care about. Its insane. Accounting is not business. Innovation and marketing matter as much if you are to offer a product or service. Share buy backs are simply an admission that you have failed at your core business. So long as “someone else” pays for “needed expenditure” then it is very needed. If they tax you to pay for someone else’s “needed expenditure” then it is not so needed. The U.S. economy has 2 fatal problems. The Fed suppressing the cost of capital- subsidizing the wealthy. And the loss of jobs to foreign countries through so-called “free trade”- in reality- free foreign access to the largest consumer market in the world. The bandied-about “Service” economy is entirely parasitical. It relies on taxes or government compulsion to pay, e.g. Obamacare- where you are required by law to pay for something even though you may not want it. Without manufacturing- even if it is building factories that are heavily robotic- this country has no “value-added” for a tax base. As an outside observer the only solution I can see is a miracle where the DEMS win a landslide in November and also take back Congress. Long odds there. İ cannot see much “healthy” about it actually What am İ missing? wolf this trillions you speak up of were not actually put in a position to be used. it was horded by the rich and never distributed through the rest. they took this taxpayers bailout money and bought cars houses art and yachts. the money becomes null and void. capitalism at its core. greed and now the seed if bearing new fruit. the fed did its job the last time but it proved that it cannot trust the same scheme twice. people wonder why there are so many regulations put on business and corporations. them they turn and bite the hand that feeds by hiding their money and not pay taxes. so what happens u run out of money and you have to raise taxes to cover whats missing. oh well. you wonder why things happen and we are about to repeat it all over again. common sense isn’t as common as you think. buy gold and silver. wolf whats you thought about gold miners?? when gold hits $2500oz. that will make for some good profits. Who is actually going to be buying physical at that price?????? All the gold bug’s are screaming BUY gold (As they place sell orders their current paper gold holding’s), but nobody is getting Physical delivery. Silver is still under 18, so Gold should be between 180 and 360, its over 1300 so its only somewhere between 300 and 600% over priced. Before you laugh check the divergence between silver and gold post WW II, and tell me who is Manipulating whom. Gold is the big inconsistent metal. Although it has dragged Platinum with it as the Highenders seem to have a bigger love affair with it, than Gold. If this all plays out according to the Deflationary Scenario then gold may end up at only $500 per oz. Or less. But 100 ozs. would purchase a mansion or a yacht. Gold only goes up in an inflationary scenario… It only has value in comparison to other assets. It is no longer a means of exchange. It may end up backing a means of exchange in the end but that is a long time down the road. It is hard to get my head around the possibilities. A Deflationary Depression is the out come of a Super Debt Cycle or it should be. As debts are defaulted on, the monetary aspect of value also gets hammered. After all, in a fiat system, debt = money.. Wipe out the debts and you wipe out the money. So if you were worth a million$ today, afterwards you may be worth only $100k but still have all those assets you had no debt against. I have never seen a Deflationary Depression. I would assume that it destroy the value of all assets and not just a few..
Those wishing or predicting a significant rise in PMs would be thinking of an Inflationary cycle. I think if we were going to have one of those, it would already be evident… Only Inflation I see is in bubbles as in real estate, health care, educational services, art and yachts. All of which have or will have peaked and will in the end be much cheaper. Well, some other things have gone up but as they go up in price, but as you have seen, the demand goes down, the production goes down and the wider margins go to cover the additional debt servicing we know is added on to everything. This debt cycling of price increases going into debt servicing is why the economy isn’t getting any better. In fact it is getting worse as more and more of what was once profit goes to servicing debt. So I conclude that in the end we have a Deflationary Depression to wipe out all the unproductive and unnecessary debts. And probably all debts with it as the entire world seems to be correlated now. The purchasing power of gold, has to go down, to less than 20 times the purchasing power of silver . Or all other metals must increase the purchasing power so that gold buys less than 20 times silver. Gold today is the most manipulated and hyped item in the very false market. Which is why all the gold bugs who have physical are SCREAMING BUY GOLD. As they have financed against their gold, and if it’s purchasing power drops. A year later, after I’d lost about 30%, I sold. Silver went on to decline for another 2 decades or so. It’s now a few bucks above where it was when I’d bought over 30 years ago. Inflation would have wiped out much of the value had I kept it for that long. So I learned not to have an opinion about PMs. And I don’t. Gold and silver would have to drop a lot further before they’d trigger some sort of opinion in me associated with an urge to buy. Wolf, I am not sure, but I am fairly positive that hamburgers were put into “industrial production” category in late 2008 or early 2009. The industrial numbers were so bad that they moved over McDonald’s and Burger King to give them a boost. If that had not happened I think the line in the graph might still be showing the recession. Also I think at roughly the same time they let stuff only packaged here be counted, whereas before it had at least to be assembled here. I don’t have access to Sharelynx subscriber graphs but I think he charted this. The last time I ate a McDonald’s hamburger (20 years ago? ), I decided that is was actually the result of industrial production and not meant for human digestion. I stopped eating at Mickey Ds when my dog sniffed and rejected a bite of the sausage muffin I was eating. Never been back. Haven’t eaten fast food of any kind for years now. 2 books to read are “Betrayal of Food” and “Wheat Belly”. As an experiment some local students put a donalds burger in the fridge and left it there to se what would happen, after a whole school year it was still not moldy yet all the vegetables and meat that had been been stored around it in the same experiment had to be discarded in a matter of week’s. Even their cheese does not decay normally. Doomsday Preppers take note — forget about canned beans — skip the expensive freeze dried beef wellington…. But a 20ft shipping container and store your meals inside under lock and key…. along with 10,000 rounds of ammo and some guns. Ever seen that blog by Chris Martenson? He tells you all about the end of the world — then he promises to explain how to survive … but you need to pay for the answers…. there’s a review of Rana Foroohar’s new book, ‘Makers and Takers – The Rise of Finance and the Fall of American Business’ that spells out some of the how & why we are looking at reduced industrial production and absurdly low interest rates. WolfStreet readers may want to check it out. All of the above comments are spot on in their analysis/views I reckon! Thanks for the recommendation. That site is now on my daily reading list. The fed knows the stats are lies and now even the lies are not looking good. Raise rates? I doubt it. There’s little demand for debt (risk) because real growth is not happening. Not sustainable – The increase in the overall cost of living restrained paychecks, separate figures from the Labor Department showed Thursday. Hourly earnings adjusted for inflation were unchanged in May from the prior month. Middle class folks are getting abused by housing and wages. This cannot go on. On the auto front, there’s further concern that we’re seeing a credit bubble. If risky loans are fueling the auto “boom”, we’re in for an even more painful landing than expected. “Things are different this time” is a grossly abused catch-phrase, generally used just before the implosion of an asset bubble, but seems to be accurate this time when applied to the aggregate or general socioeconomy. We are entering a new socioeconomic epoch, which will result in drastic changes, at least as profound and significant as the industrial revolution, but compressed into a single lifetime. It is up to us to minimize the destructive chaos which will occur, e. g. the French, and Russian revolutions and the attempted revolutions of 1848. The major shift seems to be due to two synergistic factors, the introduction and increasingly rapid proliferation of automation/robotics effecting the blue collar workers, and “artificial intelligence”/”big data” effecting the white collar workers and professionals, reducing the need for employment in these areas. There also also the disruptive effects of the increasingly rapid advances being made in the science fiction fields of bio-engineering and nano technology. * From an economic perspective, if the “consumer” has no income because they have no job, they can’t consume, no matter how cheap the product. * Reduce the standard work week to 30 hours or less with no reduction in total income, coupled with an increase to 15$/hour in the minimum wage, which should be CPI-U indexed. This is to insure that the “productivity” gains are to some extent shared. * Large increases in useful public works [as the employer of last resort] such as the demolition of derelict and abandoned buildings in our inner cities, the construction of durable adequate low rise public housing, and investment in adequate basic education promoting self improvement and acceptable social skills/interaction for all, rather than academic skills for the few, simply promoting more formal/academic education as an end in itself. This is to integrate as many people as possible into the productive sectors of society, thus promoting a sense of community. Those public policy initiatives all make perfect sense. But we have NO public policy unless it relates to enriching the ruling class, pushing more debt on the serfs, and making more foreign wars. We only have the Pentagon…. Everybody else fell in line. Our industry was sold to China to in the 70’s to continue to fund with debt, our rapacious Pentagon. The empire will itself crumble as the MIC storms around the world trying to find the last drops of cheap oil that it already spent fighting Vietnam. Since they won’t find anything with decent EROI…. they are off to Mars? Rearranging the deck chairs on the sinking Titanic may have been seen as being artistically pleasing, however did not alter the ultimate outcome. Another suggestion, grant citizenship to the estimated 10 million illegals in the US, that’s a lot of new tax payers and future debtors (houses, credit cards, car loans ect…). RE: Another suggestion, grant citizenship to the estimated 10 million illegals in the US, that’s a lot of new tax payers and future debtors (houses, credit cards, car loans ect…). This is coming, but remember that most of the new citizens will have very different sociocultural values and “world views” than do the traditional American voters. Having seen the immigrant community up close, I can tell you that making them citizens won’t stop them from exploiting the system. The will use the status to bring in more relatives. They will not be leaving their off the books jobs because they are used to all the extra income and need it. They may put some income on the books but it won’t ever be the bulk of it, just enough to qualify for other benefits. If you want to know how to get over in America, you need to talk to an illegal immigrant, it is really unbelievable what they get away with. You missed an IMPORTANT basic. Since WW II the Population of the world has more than tripled. Three times as many Mouth’s for the same cake. Now technology is making many of those Mouth’s, unwanted. Also the Excessive volume of Mouths, are consuming finite resources, at an alarming rate. Causing massive, and some irreparable, damage to the Planet. Population must be managed in a 1 child policy globally, until all the ethnic groups reduce to at least their 1945 levels, preferably their 1900 levels. china showed it works, and china showed the Asian flaw that must be avoided in a 1 child policy. The Planet is simply a huge farm, and humans are the Major livestock on it. Overstock a conventional, not factory feed, livestock farm and watch what happens. This is what is happening to the planet. Our advanced Economies are simply part of our food source and they are Collapsing as we are Overstocked. I continue to maintain that the US is in a long, slow and drawn out DEPRESSION. Regardless of the fancy numbers games we get from the Fed and other “reports” propping up the market saying, “ohhh look we’re going into a recession or we’re coming out of one.” I think it’s clear that since around 2007, we’ve never left a depression. The indicators are everywhere. I was just reading this article from last month about how shipping is down the worst in the 1st quarter 2016, but each previous year in the past 3 years have been worse than the year before it. Somebody needs to explain to me how this $15 minimum wage is going to work. Does anybody really think that it’s going to trigger “trickle-up” pay raises for anyone else? In my line of work (fixing airplanes), the PTB have been complaining about a “lack of skilled workers” for several years (in fact, they were saying the same BS in 1979). Yet absolutely nobody is trying to outbid other employers for help. Starting pay with a couple years of experience is around $16/hour. Top of the scale for guys with 10-20 years of experience and acting as crew chiefs is $34.00. Raises are 1.5% every other year thru 2024. This is a “best in the industry” pay rate, under a union contract. It seems the PTB have decided that certain jobs, no matter how much of a shortage of labor there is, just aren’t worth more than about $70K/year, no matter how good you are. Can’t find qualified people for what you want to pay? Lobby the government to reduce the regs/lower the standards. Can’t find help? Just mandate that your current employees put in 1000 hours of overtime a year. There is no such thing as the “free market” for working stiffs. And, if you complain too much, the Air Lines will have all work done in a “low cost” country, like, say, China and there they make, what $2.50 an our to work on American Airline engines? When the airlines find it cheaper to fly the plane to Panama for repairs than have the work done in the USA, you either move to Panama or get yourselves a lobbyist to force the airlines to have the work done in the USA or loose certification. This is how to get things done in America, hire a million dollar lobbyist and make the law. The banks did it, so can you. This is the price workers and savers pay when politicians promise everyone a free lunch and people are STUPID enough to vote for them. If you think ‘lunch’ is expensive now, just wait until it’s free! The chart shows you the result. One way or another, We The People pay for EVERYTHING. Taxes are only one way to pick your pocket. Another more devious way is to debase the currency, and that has been happening for some time now. Union in this family here also. Top scale is 16.25 ‘on the check’. However, this was a division of a multi-national corp. that was sold off 4 years ago to a private equity firm. They bought it with the knowledge (and the reflected price paid) that they owed 12 million in payments to the pension plan. They threatened to shut down if the pension plan was not revoked. They called for big cuts in healthcare benefits. Being this is the largest employer in a very rural county, the union brothers passed the cuts after 3 votes and more threats. The company got a 12 million dollar windfall and no future pension obligations. The workers got the shaft. It is now no different than working non-union. The PE firm needed the union stamp on the product to be able to sell in certain cities. Now the union members pay monthly dues to allow the employer to use the stamp. lol. The healthcare benefits are no better than ACA. Fear of job loss makes workers willing to give up the things they worked decades to get. I spent the day calling up doctors from my insurance company’s website, not an exchange or Obamacare. It took me all day to find one that would actually accept the insurance as payment up front. They all wanted to be paid upfront. I asked the insurance company if that was ok and they said a lot of doctors and clinics, in the network, now want to be paid up front. They said I could then file for a reimbursement. What’s up with that? Another way to stress working people? I am so ready for a single payer system. Petunia, that was the plan all along. Upset the “patient” until they demand “single payers” (Post Office style Health care, if you want a hint). The reason so many in the health care business are requiring you to pay up front is because ALL insurance plans as so confusing, the billing & coding staff (at each medical place) don’t know if they will ever get paid. It is that confusing and convoluted. Some far worse than others. The fact you had to call around so much is proof most medical practices DO NOT LIKE YOUR PLAN since it is both confusing, doesn’t pay, is a headache, or doesn’t pay enough to stay open. You have learned what your boss or insurance agents never told you: Your plan stinks. I don’t even take ACA at all at my practice. Two of the “plans” are so damn confusing, that NOBODY at my practice, or at the practices of friends, can figure them out. We don’t even have any idea what to charge the patients for co-pays? There are two non-ACE plans so awful that THEY don’t even know what they are doing. My billing and coding staff MAKES UP the prices and we are getting paid a decent amount. We have been doing this for 3 years and if they ever ask, we will flat out show them our numbers. Since we “bill” them less than the Medicare allowance, there is no “crime”, just confusion. BUT, these companies, like so many, are so understaffed, with really dumb staff, that I am confident they have no clue what they are doing. FUBAR. Are doctors supposed to work for free? Do you? Would you run a business where you have no idea what to charge the customer, then bill a 3rd party, with no idea what you will get paid, and the customer is long gone and says they have “hotel insurance, too bad greedy Hotel owner?” No, you would not. Single Payer will “solve” the payment part (MAYBE) but it will destroy the Medical part. By the way, a basic service I charge a patient, without any insurance, is $58. I bill all Insurance at $152 and they pay me 80% of that…$121. So, if you have NO Insurance at my practice, you pay $58, but the people don’t want to even pay this. Greed. A practice is not supposed to charge different prices for different “people”. EVERY PRACTICE does this. Talk to your medical providers and ask what the “cash” price is. You will be amazed. Insurance is a total rip off that doubles and triples the costs. BUT, people want it for FREE (not pay $58) , so therefore, I can make $121 but we ALL PAY MORE FOR THAT GAME. Including you. I do understand your side, but you are giving your patients a bad wrap. They are not greedy for not wanting to pay the $58 you charge. They are already broke paying $700+ a month in premiums. At those prices they should be getting excellent instantaneous health care and all they are getting is another bill. While I understand the system is totally broken, I don’t see doctors lining up to change it either. They are only burdening the patients even more. “Do no harm” is long dead in the medical profession. However the amount doctors take in salary and associated benefits, direct and indirect, needs to down, a huge amount globally. Particularly in the US. Healthcare in the US, is a protected MAX profit industry, across the Board. You only have to compare the cost of medication’s in Canad and the US to see what is going on. The fact that it is the US game dosent make it wright. The ONLY people who provide you with any health care is the nurse and doctor standing in front of you. Everybody else in the “business” is an expense and are there to DECREASE the cost paid to treat you, but INCREASE the revenue. The Government and the Insurance Companies and the Hospital and not there to provide you with better care. They are there to make money and they take the vast bulk of it. You should wish your nurses and doctors made a lot of money. Guys who play basket ball make $10 Million a year and provide NO health care or anything of value to society. You want awesome health care? Pay every nurse $250,000 a year and get rid of Insurance Companies and Government involvement. But the people won’t do this. They want “free” health care. Just remember, the cheapest health care is…….no health care……and as Petunia has said, that is what she is finding. The money is not getting to the nurses or doctors. In the stupid American extortion system that is claimed as a helth care system yes. Not in other countries, the statement still applies doctors charge and take to much. Globally. Health care workers are on average overpaid globally. Vets have to know a lot more have much better diagnostic skills yet get paid far less??? Free health care is possible. The NHS worked Almost perfectly untill the mid 60’s, when they allowed the English social systems to be overloaded with freeloading immigrants who had never contributed to the system. Now the NHS its not even a shadow of its former self. It is however still far better than what America has as a system. I am one of the people who has paid cash for health care. An appendectomy. Still cheaper than ACA and no forcing nuns to pay for abortifacients. Hard to compeat with poor people who live over the road ditch ! Large percent of Asia dose !